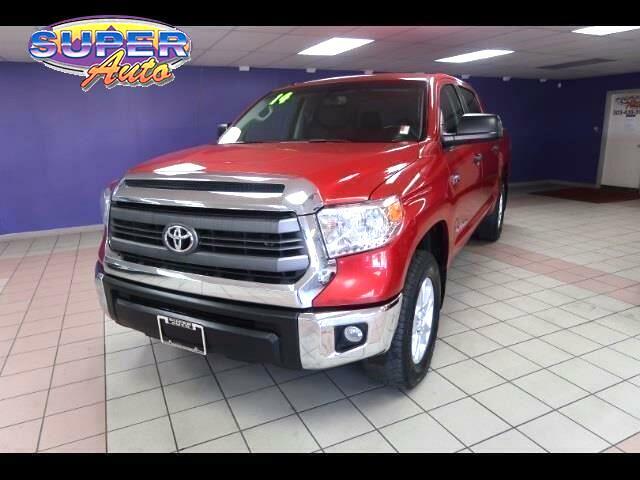 Used 2014 Toyota Tundra CrewMax 5.7L FFV V8 6-Spd AT SR5 (Natl) for Sale in Denver CO 80204 Super Auto Company, Inc. Features: **BLUETOOTH**, **NAVIGATION**, **BACKUP CAMERA**, **CARFAX GUARANTEED**, **ONE OWNER**, **BED LINER**, **TOW PACKAGE**, **TINTED WINDOWS**, 4WD, Black Cloth. We have been in business for 26 years and for over 20 years have been an A+ Rated Company by the Better Business Bureau!! Know who you are dealing with!! Come to www.superautocompany.com to See Our Specials!!! Call Us at 303-436-9559 so we can answer any questions you may have.